After first creating my LUFA USB stack for the USB AVRs, I decided as a side project to create a new firmware for the entire USB AVR range, which would emulate an AVRISP-MKII. 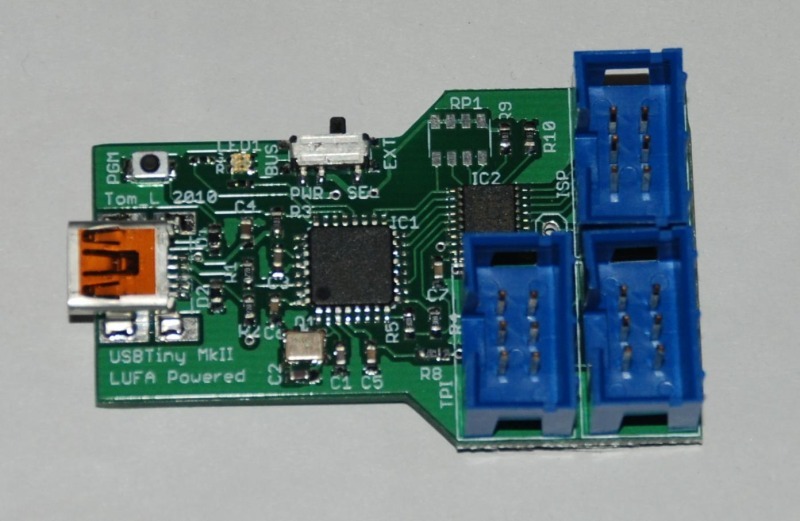 This project is a clean-room copy of the AVRISP-MKII functionality, supporting the programming of the entire 8-bit AVR range via ISP as well as the PDI (for the newer XMEGA AVRs) and TPI (for the 6-pin TINY AVRs). It is entirely open source and has a wide range of configuration options to adjust the feature set and pin-out. When compiled for the XPLAIN board target, the code will automatically function as a PDI programmer for the XPLAIN board using the optimal settings. This will allow the XPLAIN board to be programmed from within AVRStudio without additional hardware. Special thanks to Tom Light, who has been instrumental in testing new code revisions to ensure correct operation. For device pin-out information, build the Doxygen documentation from the source by executing "make doxygen". The resulting documentation will be located in the /Documentation/html/ directory of the source folder. 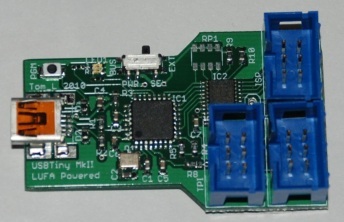 No schematic for the clone programmer is currently provided - it is up to the user to design their own schematic from the example schematic in the USB AVR's datasheet, plus any additional desired hardware. The pinouts between the programmer AVR and the target are given in the project documentation; at its most simplest the two can be directly connected together with no isolation. Level conversion, isolation or any additional features may be added to suit the end use environment.